← Download the Kohl’s Art Generation iPod Touch App! Milwaukee Art Museum American Paintings gallery, August 2011 reinstallation. Photo by Mel Buchanan. The newly reinstalled galleries in the Museum’s lower level offer a survey of the American paintings collections from the Colonial era to the turn of the 20th century. The nearly fifty objects on view showcase not only a history of American art, but also the history of the Museum’s interest in American art. 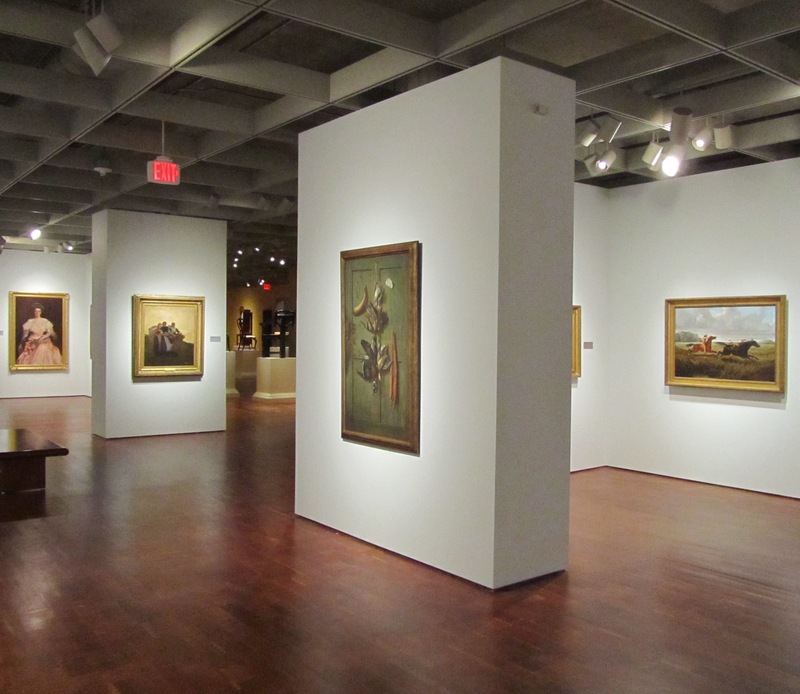 Around half of the paintings on view are part of the Layton Art Collection, Milwaukee’s first public art gallery and our present-day Museum’s parent organization. The Layton Art Gallery was founded by meat packer and philanthropist Frederick Layton in 1888, and you’ll find Layton’s monumental 1893 portrait by Eastman Johnson still on view in the newly-installed American painting gallery. The other half of the collections on view represents works acquired by the Museum as gifts and purchases, both before and after its 1957 merger with the Layton Art Gallery. Old favorites remain, but there are many new additions pulled from Museum storage. Attributed to Thomas Smith (American, active 1680-1693), Portrait of a Man, probably Eliza Hutchinson, ca. 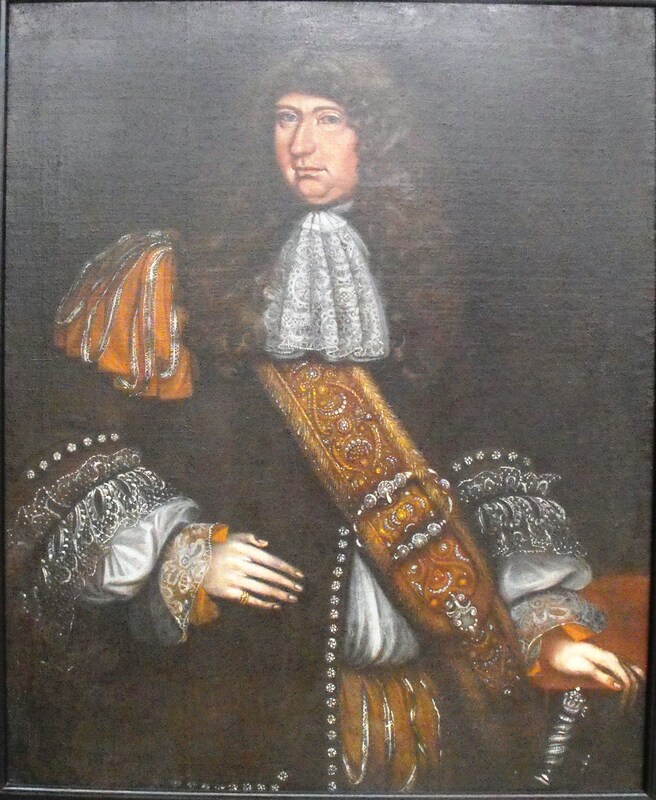 1675-1690. Oil on canvas; 43 ½ x 35 ½ in. Lent by the Fogg Art Museum, Harvard University, L115.1993. Two extraordinary Colonial portraits, on long-term loan from the Fogg Art Museum at Harvard University, complement the installation. These loans were initiated by long-time Museum supporters Anne and Frederick Vogel, whose work for the Museum and Layton Collection were instrumental in developing the American programs and installations, particularly the growth of the decorative art collections. One of these loans (shown at right) is one of the oldest surviving American paintings in existence, a portrait of a man believed to be Eliza Hutchinson painted by Captain Thomas Smith. Smith’s painting returns to view in his entire awkward splendor, joined by the commanding portrait by John Singleton Copley of Thomas Boylston, Jr.
Several works are on view for the first time in a long time, including a marvelous early nineteenth century portrait of a woman by Rembrandt Peale. Previously unidentified, the oil on canvas painting is now believed to represent one of the two Knapp sisters of New York. 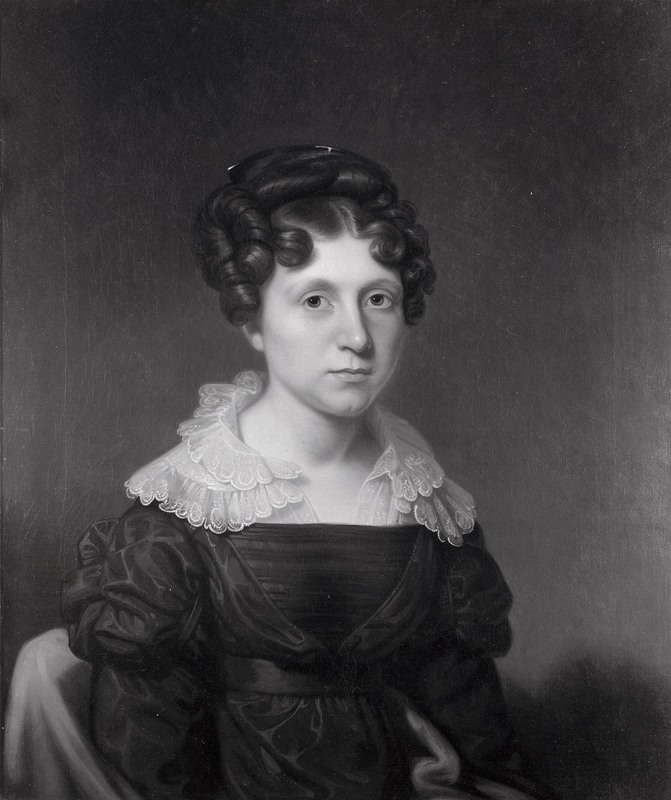 Rembrandt Peale (American, 1778-1860) Portrait of Miss Knapp, ca. 1820. Oil on canvas; 30 3/16 x 25 1/8 in. Milwaukee Art Museum, Gift of Mr. and Mrs. Maurice W. Berger, M1961.56. Photo by P. Richard Eels. The portrait (at right) was the gift of Mr. and Mrs. Maurice Berger to the Museum in 1961. It showcases the Parisian Neo-classical gloss that Peale learned from his studies with the French master Jacques Louis-David early in the nineteenth century. 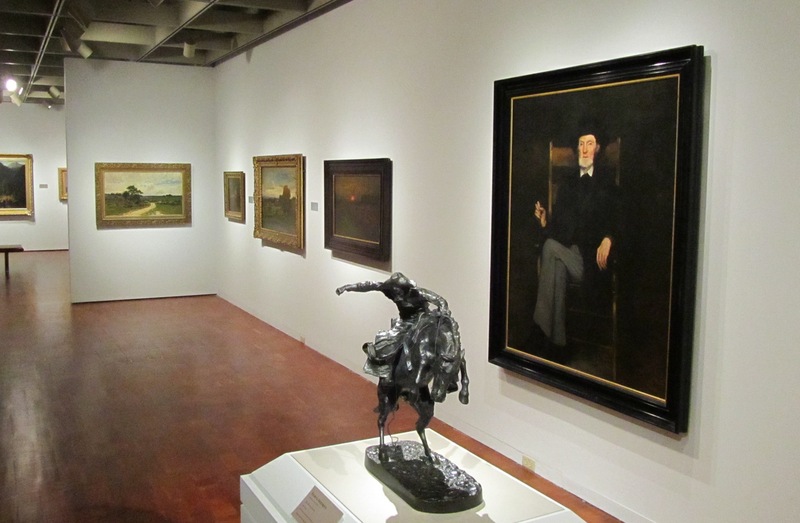 Other favorites back on view include Cincinnati-born Frank Duveneck’s masterpiece, the 1874 portrait of William Adams (shown in the image of the gallery at bottom) and Richard LaBarre Goodwin’s important c. 1889 trompe l’oeil painting, Hunting Cabin Door (visible in the gallery shot image used at the top of this post). 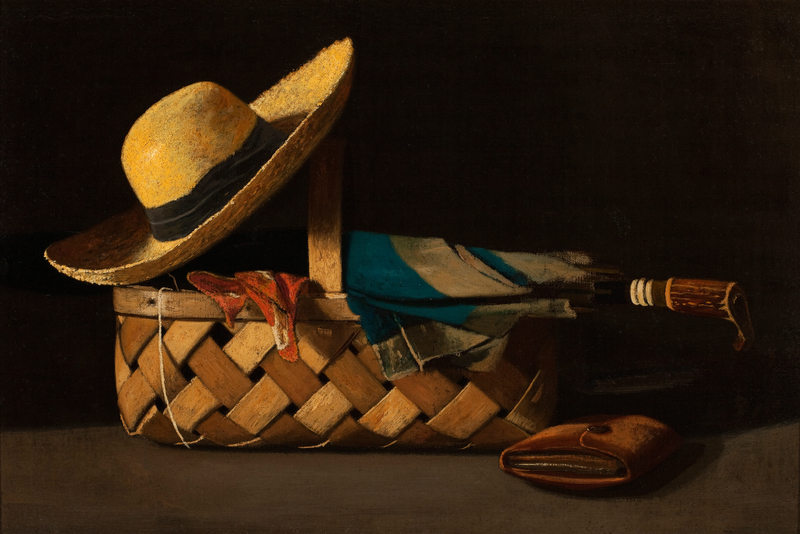 The latter work, which may be one of the artist’s earliest cabin door pictures, provides a distinctive contrast to the small but powerful Market Basket, Hat and Umbrella (after 1890) by John Frederick Peto, one of the leading late nineteenth-century still life painters. John Frederick Peto (American, 1854-1907), Market Basket, Hat and Umbrella, after 1890. Oil on canvas; 12 x 18 in. Milwaukee Art Museum, Layton Art Collection, Purchase, L1964.5. Photo by John R. Glembin. A new, unified perimeter wall color links the suite of three galleries, to provide visual unity and to offset the slightly lower ceiling heights in the lowest level of the Museum’s 1975 David Kahler concrete building. In addition, new extended labels offer concise additional contextual information about the artists and works to help round out the visitor experience. With more changes in store for the future, from reframing paintings to adding new acquisitions, we invite you to enjoy a new take on the galleries and rediscover the strengths of the Museum’s American program. This entry was posted in Art, Curatorial and tagged 18th Century Art, 19th Century Art, American Art, Art Installation, Frank Duveneck, Jacques Louis-David, John Singleton Copley, Layton Art Gallery, Rembrandt Peale. Bookmark the permalink.